Spending more on healthcare doesn’t make a nation healthier. We evaluated 5 factors to compare the state of health around the world. According to the Los Angeles Times, the United States spends more on healthcare than any other country in the world. But that high spending doesn’t mean we are healthier than other countries. A look at healthcare costs and service outcomes seems to indicate that others are getting more bang for their buck. GDP, or gross domestic product, refers to a value placed on a country's goods and services. It is the single most important measure used in determining inflation and the economic health of a nation. At 17.2 percent of GDP, the United States was definitely spending a higher percentage of its resources on healthcare in 2016 than these other developed countries. Another useful way of looking at what a country is spending on healthcare is to examine the average amount it spent in a year per person for this purpose. This number can be compared to other years and to other countries to get some idea about the effectiveness of governmental policies concerning healthcare. 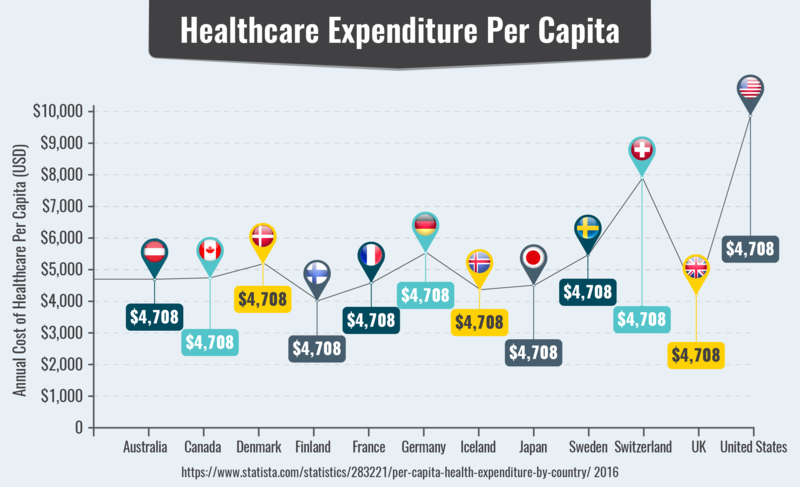 With numbers such as these, we can compare what other developed countries spent on average for each of their citizens in 2016 in contrast to the United States' per capita healthcare expenditures that year. In the United States, the annual cost of healthcare per capita was $9,892.00 and is still rising. While politicians fight with one another, the United States continues to be number one in high healthcare costs per capita. The infant mortality rate is based on the number of deaths in children under one year of age per 1,000 following live births. The highest rates in the world are found in underdeveloped countries without government services, clean water or adequate health care. 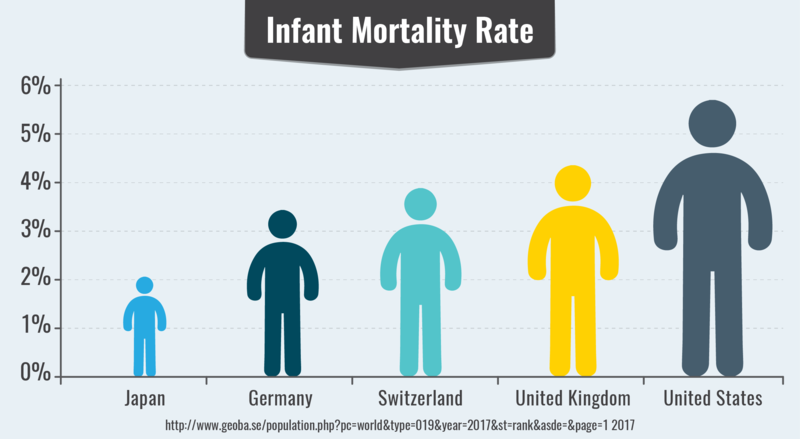 The infant mortality rate remains higher in the U.S. than in most other developed nations. The infant mortality rate in the United States is estimated to be 5.67, almost three times that of Japan. Life expectancy is the average number of years persons born in the same year are expected to live and is based on the numbers and ages of recorded deaths. 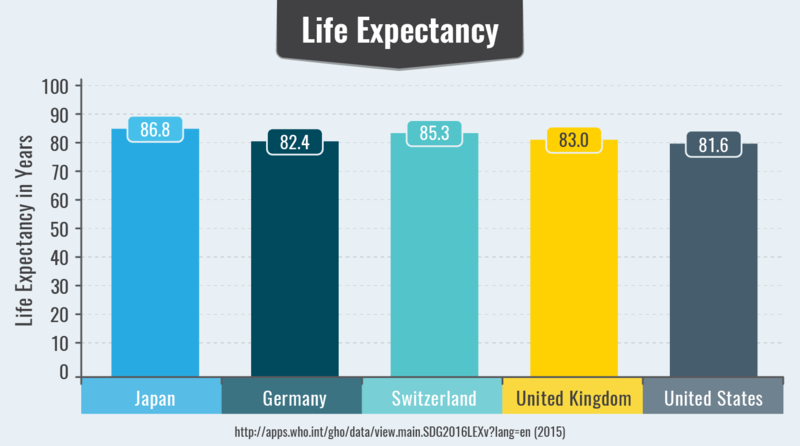 In the U.S., life expectancy is surprisingly lower than in many other developed countries. For the United States, the average life expectancy was 81.6. That is five years less than Japan. MRIs are used to take pictures of the inside body structure and of organs. They are used both for diagnoses and for monitoring certain treatments. A recent Globe Newswire article from October 2017 reported that the "Magnetic Resonance Imaging Systems market is projected to exceed USD 8.5 billion by 2024." The high costs associated with MRI Machine use further restricts the likelihood that poorer countries will be able to afford the machines in their local environments. 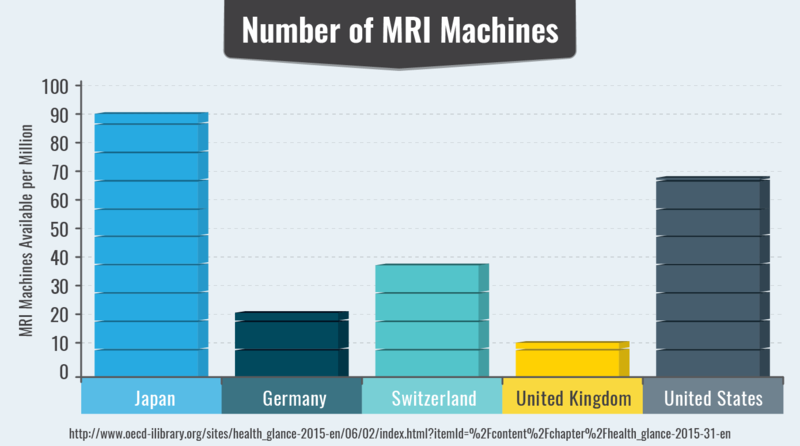 In the United States, 35.5 MRI machines were available for every million people, second only to Japan in this grouping of industrialized nations. Statistics such as these beg the question of why the United States spends so much on healthcare but achieves inferior outcomes to its neighbors. The answer may lie in costs for drugs, medical equipment, health insurance administration and waste.